IDIBELL is a young institute which reflects the experience of previous research institutions established in the Bellvitge campus, one of the areas of Spain with a higher clinical and university level. In this privileged environment, IDIBELL have the opportunity to develop research activities aimed at solving the health problems of citizens. During the last years, IDIBELL research activity has grown considerably and now the Institute stands among the best research centres of Southern Europe. In 2012, IDIBELL scientific indicators have continued to improve, both in quantity and quality, which places us as one of the leading health research centres in the country. In 2012 the Institute has fostered the transfer of scientific results in order to improve people’s health. These results are due the work of all professionals in the institution as well as the involvement of IDIBELL’s partners. L’any 2010, l’IDIBELL ha continuat apostant per la recerca de qualitat enfocada a la millora de la salut de les persones. Els investigadors de l’Institut han continuat publicant en les millors revistes científiques internacionals i participant en projectes de recerca capdavanters nacionals i internacionals. L’IDIBELL ha posat en marxa un departament per promoure la transferència de tecnologia per aconseguir aplicar els resultats del treball realitzat pels investigadors del centre. Aquesta tasca depèn de la col·laboració amb altres institucions. En aquest sentit, l’any 2010 l’IDIBELL ha enfortit els seus convenis institucionals i s’ha integrat en diverses xarxes de recerca. En el camp dels assaigs clínics, l’IDIBELL ha consolidat la seva participació en el CAIBER (el Consorci de Suport a la Recerca Biomèdica en Xarxa del Ministeri de Ciència i Innovació). L’Institut ha estat un dels puntals del projecte Health Universitat de Barcelona Campus (HUBc), que ha estat acreditat com a campus d’excel·lència internacional pel Govern espanyol. L’any 2010 l’IDIBELL ha continuat treballant en el projecte Biobanc, que es convertirà en una de les col·leccions de mostres biològiques més grans de l’Estat. Els biobancs són recursos essencials per poder realitzar recerca d’alt impacte científic i social, i és un dels projectes estratègics més destacats de la institució. Aquest any, l’IDIBELL ha començat a definir el seu pla estratègic pels propers anys i a repensar les seves àrees de recerca. El desenvolupament del nou pla compta amb la participació dels investigadors de l’Institut. L’IDIBELL està fermament compromès amb la gestió de la qualitat i ha començat a adaptar els seus serveis de suport per obtenir l’acreditació de qualitat sota els estàndards de la ISO. In this sense, on 2012 the institute has been consolidated as a leader in healthcare innovation, having driven a system of innovative public procurement in the field of health, in which the contractor and the bidder share the risks of the application of a new technology. The model, common in other countries, leverages the high purchasing capacity of the public sector. Besides the price, the system takes into account other factors that are not usually kept in mind as industrial innovation and savings that the new technology can bring to long term. The number of patents developed by IDIBELL researchers this year has also increased considerably, as well as the license agreements with companies. The institute strengthens its local presence in collaboration with close institutions that allow to inform citizens about the activities carried out by IDIBELL researchers and spark interest in science among the population, especially among the youngest people. At the same time, IDIBELL is clearly committed to internationalization, through the participation in research networks but also with the signing of cooperation agreements with international research institutions and the organization of conferences, symposia and seminars bringing together leading researchers from around the world. 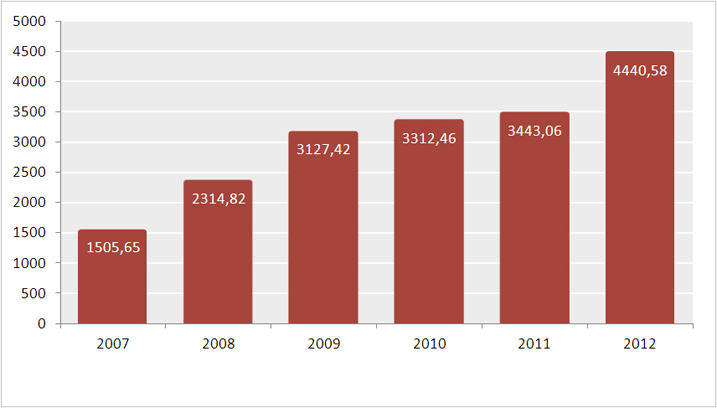 Regarding the scientific production, in 2012 IDIBELL researchers have increased dramatically the amount and quality of their published articles. The total impact factor has grown over a thousand points over last years and the average impact factor rate has improved considerably. This activity demonstrates the dynamism and experience of IDIBELL researchers. And these good results have been possible thanks to the work of more than 900 professionals, hired or appointed, that belong to IDIBELL, and the support of the institutions that are part of the institute, without which our center could not exist. 2012 has also been a year of change in the direction of IDIBELL. Josep Manuel Menchón has joined IDIBELL as new scientific director, replacing Gabriel Capellá, who has held this position for the past four years. During the period that Dr. Capellá has been leading the Scientific Direction IDIBELL has increased their results and has positioned as one of the reference health research centres in our country.